You can contact our Tech Support by emailing: tech.support@SnapComms.com or via Live Chat on this website. How can we help you? You can contact us at info@snapcomms.com or by filling out this form. 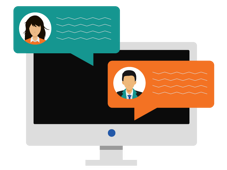 We love to meet people who are looking for a better way to communicate with their employees. Every year we attend many conferences around the world, including: IABC World Conference, HR Technology, SCCE, HCCA, Hospital and Healthcare, and many more. Come by our booth and say 'Hi' if you're in town too!